Plot Summary: It all began quite suddenly. 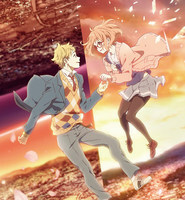 Akihito, who appears human but is actually half yomu with the power to quickly heal himself, sees a freshman girl who appears ready to jump from the school rooftop. The girl, Mirai, who has the ability to manipulate blood, which is unique even among members of the spirit world, continues to fight her isolation. Akihito decides at that moment to save Mirai, but disturbing events soon begin to unfold.